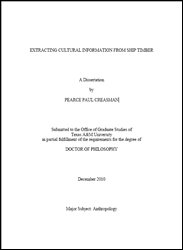 Pearce Paul Creasman, Extracting Cultural Information from Ship Timber, Texas A&M University, 2010. This dissertation is rooted in one general question: what can the wood from ships reveal about the people and cultures who built them? Shipwrecks are only the last chapter of a complex story, and while the last fifty years of nautical archaeology have managed to rewrite a number of these chapters, much of the information unrelated to a ship’s final voyage remains a mystery. However, portions of that mystery can be exposed by an examination of the timbers. An approach for the cultural investigation of ship timbers is presented and attempts are made to establish the most reliable information possible from the largely unheralded treasures of underwater excavations: timbers. By introducing the written record, iconographic record, and the social, economic, and political factors to the archaeological record a more complete analysis of the cultural implications of ship and boat timbers is possible. I test the effectiveness of the approach in three varied case-studies to demonstrate its limits and usefulness: ancient Egypt’s Middle Kingdom, the Mediterranean under Athenian influence, and Portugal and the Iberian Peninsula during the Discoveries. The results of these studies demonstrate how ship timbers can be studied in order to better understand the people who built the vessels.